Mirror photo by Gary M. Baranec Ken Loucks, a machinist and welder at Penn Public Truck & Equipment Inc., rebuilds a spindle on a drive housing. The company was founded in 1918 and started out making wheels and springs for horse-drawn carriages. Today, Penn Public offers numerous services and is about to celebrate 100 years in business. Penn Public Truck & Equipment Inc. is a well-kept secret. “We’ve been here for 100 years, and people don’t know we are here. We do things other people don’t do any more,” said Debbie Gentry, who has been the office manager since 2003. The business was founded in 1918 by Roy Rittenhouse on what had been a stable along Sixth Street between Seventh and Eighth Avenues and was first named Altoona Auto Spring Co. Now it’s marking 100 years in business. Today, Penn Public sells all types of truck and trailer parts, along with repairing trucks, trailers and equipment. The machine shop can fabricate and straighten all types of housings. 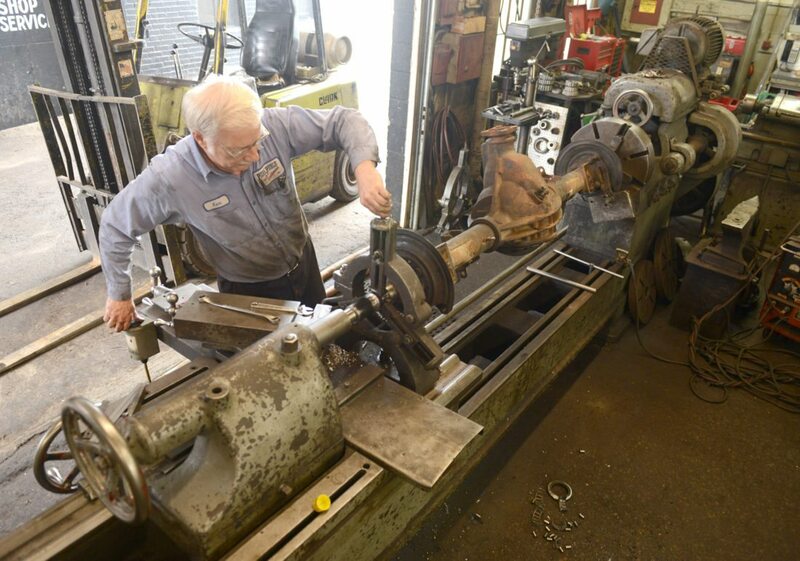 Penn Public makes and repairs driveshafts and does welding and axle repair, including on-site axle repair. Penn Public has always specialized in leaf springs and suspension repairs and also does alignments on trucks and trailers. In 1922, the property at 1015 Eighth Ave. was purchased and the company name was changed to Public Spring and Wheel. When Roy Rittenhouse died in 1940, his oldest daughter, Thelma Rittenhouse, took over the business. Throughout the years, Thelma built it up to a thriving company. She purchased many properties in the area and expanded the business, both physically and financially. In 1985, as Thelma was retiring, she sold the company to a group of the employees who incorporated the company as Penn Public Services Inc.
On Jan. 2, 2001, Mike Ventre bought the company and formed a corporation named Penn Public Truck & Equipment Inc.
Today, the business at 714 11th St. has about 2,000 square feet of space housing alignment, machine, spring and drive line shops and service areas in two buildings. The business started out making wheels and springs for horse-drawn carriages, and today, it performs many tasks, including large truck repairs. Today, the business employs 13 full-time people. The high mark was 20 in the mid 1980s. “When Thelma was here, she was a real businesswoman. She made it a thriving business,” Gentry said. The company played a key role during World War II. “During World War II, the employes here were exempt from service. Penn Public had a contract with the Army to make tent stakes, so it exempted employees from serving. However, all of the men eligible to serve did serve during the war, so Penn Public had to hire younger guys to fill the contracts for tent stakes. This was in 1943-44. A lot of them were here when I started in 1970,” said machinist/welder Kenneth Loucks. Over the years, the company made drill bits for the mining business, and today it makes railroad car springs for the Everett Railroad and Strasburg Railroad. Today, most of Penn Public’s customers are within a one-hour radius. Taylor’s Diesel and Truck Service of Altoona has been a customer for 17 years. “When I need springs or ubolts, I get them from (Penn Public). I am totally happy with them. 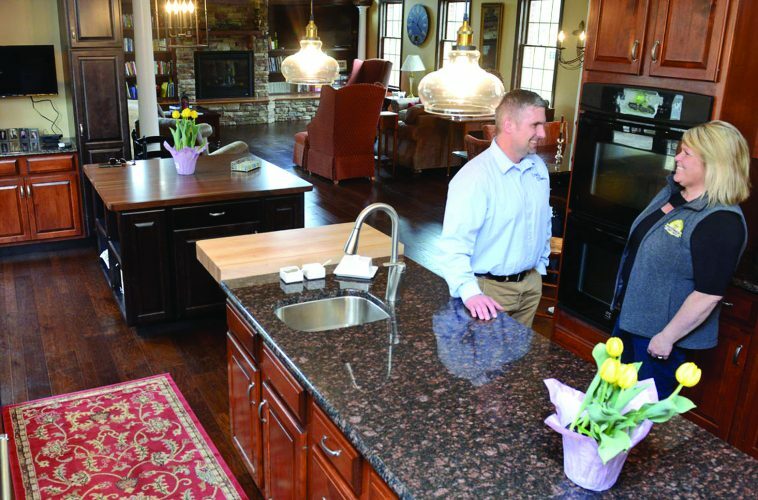 They are a pretty outstanding company,” owner Harry Taylor said. Penn Public is known for performing quality work. “We use their machine shop all of the time for anything from fixing equipment and making new pieces for the printing press and bindery equipment. The quality of their work is excellent. I don’t go anywhere else,” Dave Hogan, owner of Press Box Printing, said. The business has survived by changing with the times. “Vehicles have changed, so we’ve had to change. We had to change to the newer technology, like reading a computer, but we can work on a truck without reading a computer. We have our hands on it; the men have a feel for it. Mechanics today want to plug everything into the computer,” Gentry said. Penn Public is proud to reach 100 years in business. “We’ve had to weather a lot of ups and downs. That is like a relationship: You can be on a peak, and then you are in a valley,” Loucks said. “We will continue to put our customers first and provide them with service. We will continue to go along with the changes so we can stay here. What has helped us here is we still do the hands on work. We still have men that put their hands on things — that will keep us here,” Gentry said.